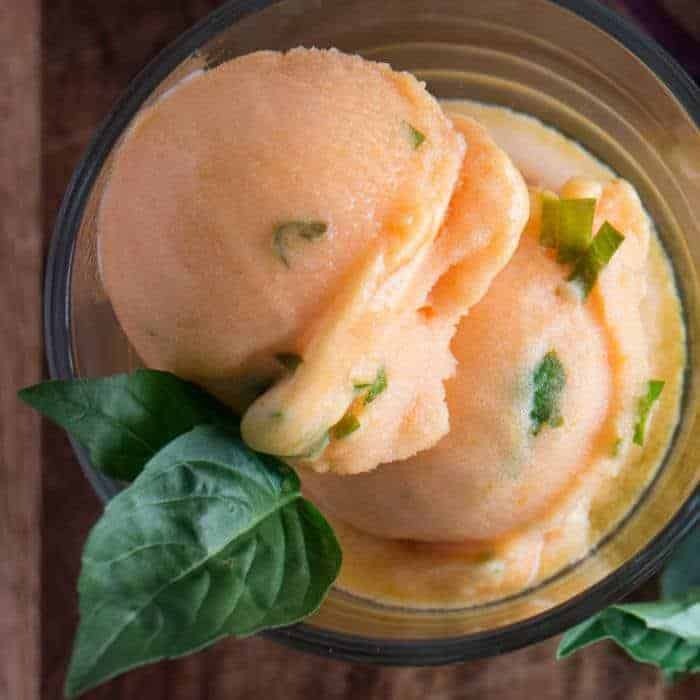 Fresh, sun-ripened apricots and crisp, dry rosé pair up with fragrant Thai basil in this light and refreshing Blushing Apricot Sorbet With Fresh Thai Basil… Not a dessert eater? This summery sorbet may change your mind when you taste it! Back to the sorbet… Really ripe apricots are key. The firm grocery store variety that must ripen on your counter just don’t have as much flavor. If you can’t find good ripe apricots, substitute ripe peaches or nectarines. The color won’t be as vivid, though. 🙂 Sorbets highlight the fruit, so use the best quality fruit you can find. Lastly, I want to explain my choice of wine for this apricot sorbet. Alcohol lowers the freezing point of the sorbet, and improves the final texture. If you’ve ever looked forward to a scoop of creamy sorbet only to discover an icy, hard product, you know how disappointing that can be. The wine cooks with the fruit, leaving behind no alcohol… It does work its magic on the texture! The choice of rosé was intentional. I wanted a crisp, fruity wine that has NO residual sweetness to compete with the fruit, and a pale enough color to allow the brilliance of the apricots to shine. A dry rosé is perfect; Crios Rosé of Malbec is lovely. Most French or Spanish style rosés will work. If you can’t find one, substitute a dry white. Don’t substitute a blush wine like white zinfandel! Yuck! The residual sweetness will definitely be too much sugar in this recipe. 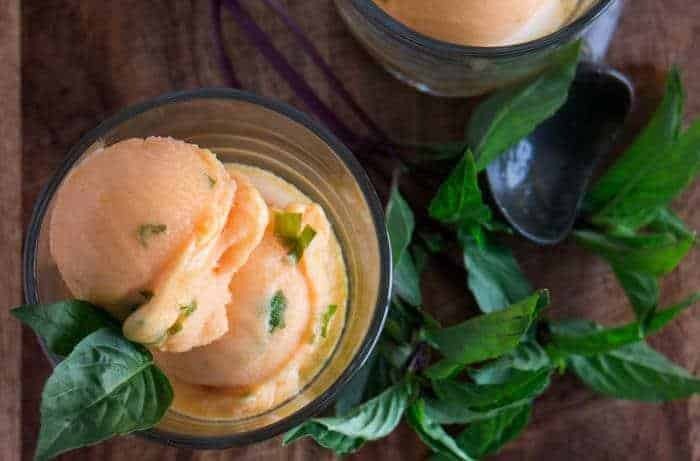 If you are at all interested in creating your own sorbet recipes, I recommend reading The Science of the Best Sorbet on the Serious Eats website. As the heat of summer looms in the northern hemisphere, sorbets hold so much appeal. I hope that you will make at least one this summer! 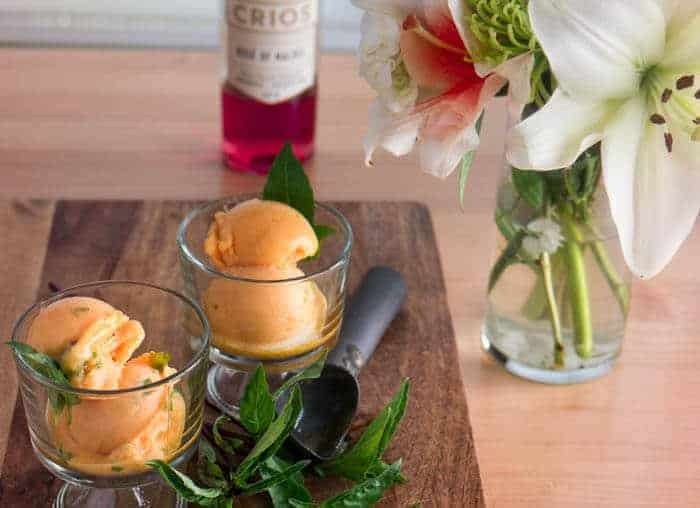 The intense flavors of summer - ripe apricots, Thai basil, and rose wine - combine in a refreshing and light sorbet that will hearken back to summers past! Add prepared apricots, rose wine, sugar, water, orange juice, and zest, and a pinch of salt to a heavy medium saucepan and cook, covered, over medium heat, stirring occasionally, until apricots fall apart, about 25 minutes. Discard zest. Pour mixture into a deep mixing bowl, and allow it to cool. Purée using an immersion blender (see notes) until very smooth. Force purée through a fine-mesh sieve or strainer into a bowl, discarding any solids. Stir in fresh orange juice. Chill, covered, until cold, at least 2 hours. Add chopped basil. Using an ice cream scoop, place 2 rounded scoops into each glass. Garnish with a basil sprig if desired. A sweet wine will mess with this recipe and make it too sweet! Choose a dry unoaked white if you can't find a rose. Thai basil has a distinct anise or licorice scent and taste that pairs beautifully with the apricots. Regular basil will do in a pinch, or even fresh mint. If you don't have an immersion blender (you need one! ), puree in a blender, but cool it first! Peaches and nectarines will also be great in this recipe! I sometimes stick the puree in my freezer to chill which cuts the time in half. I am confused, instructions state added the lemon juice and the spice bag. In the ingredients you mention orange juice and thai basil. Is the thai basil the "spice bag" or are there other spices included? Many thanks. I am so sorry Bill! Thanks for catching the error... I based this sorbet off of another one of my recipes, and that managed to slip in when I copied and pasted. I try my best to not miss details :-( I even have my husband help me proofread. I apolizee for the confusion! I'm fixing it. Let me know if you make it? 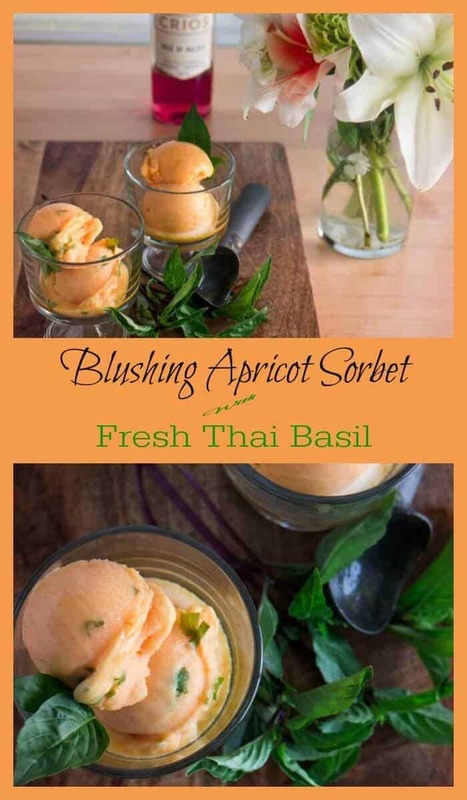 I've had a peach and sweet basil ice cream before but your apricot Thai basil sorbet looks and sounds so much better. Love the extra flavor of anise in Thai vs. sweet basil and simply adore apricots. And yes, you just can't buy ripe sweet apricots like they were picked from a tree. We use to have an apricot tree and if it didn't just fall in your hands when touch, then it wasn't ripe. :) Great sorbet!!! I love to pairing of sweets with herbs. It takes it to a whole new level of goodness. Thanks Celeste! I do as well, and I think the Thai basil with its hint of anise is so good with fresh apricots. Oh give me a scoop of that right now! Looks delicious and thanks for the wine tips. I'll have to retry my sorbet recipes with wine now! Oh the life of a food blogger! Hi Tamara! I love sorbet and this one sounds so awesome. Thanks for the tip about apricots in grocery stores! I love the flavor pairings here! I could really go for a bowl of this sorbet, you have just transported me to Summer! It is both pretty and refreshing... Thanks Sam! Summer stones are the best! I love that the peaches are paired with apricot. What a combination! I didn't know that thai basil existed, but now I am very excited to find out. Thai basil is pretty unique with its anise-like flavor. I hope you find some and give it a whirl! Thanks Mica! I love the palate-cleansing freshness of sorbets. These flavours speak to me as I stare at my Thai basil plant in my kitchen. Will have to give this a go when summer rolls around. Thank you Jacqueline! Thai basil has such a unique flavor... summer is pretty much year-round where I live. I do hope you give it a try when yours arrives! Such a cool combination of flavors. I really like the contrast of the apricot color with the green of the Thai basil. This sounds irresistable! The rose, ripe apricots and Thai basil sound like a match made in heaven. Whew! I'm glad you think it sounds heavenly :-) I have a way of combining less-than-typical flavors... Thanks Kate!